Cairn - New and Selected. Peggy Shumaker. Red Hen Press. Pasadena, California. 2018. Perhaps there is no better time than now to look at the very considered poetry of Peggy Shumaker. Shumaker, as Keven Clark says in his introduction to Cairn - New and Selected, that Shumaker has "a need for inclusion and affection." Today's book of poetry felt exactly that after reading Cairn. We did feel included by the instantly accessible poetry of Shumaker; and we certainly felt a great affection by the time we got to the end of Cairn, all four-hundred pages. Today's book of poetry wanted to write about Peggy Shumaker because of her apparent need for joy. She comes by it honesty, the need for joy. Maybe that is the search we all need most, the need for joy. Today's book of poetry guesses there might be some prose in Cairn but we're not certain, it all seemed poetic to us. The prose-poems sound just like poems should when read aloud. Peggy Shumaker comes by her chops honestly and they are cherse. These are poems that want to find that warm space between people, they strive to create community. And to hold back chaos. then make way for ripe fruit. for their moment, this morning. The reader gets the feeling that Peggy Shumaker is a woman with great patience, and the experience to back it up. From the start, Shumaker's poems have had the relaxed pace of a good story-teller. These poems resist urgency and fill up that space with necessary inquiry. There is a certain type of bravery involved, Shumaker is fearless to be sure, when you are laying it all bare and searching for the best of us. as it meets the floor. to your teeth, fire pose. until words bask in your light. Reading Cairn - New and Selected Today's book of poetry was happy to discover that Shumaker is a big believer in grace and honour and spends considerable time searching it out with these poems. One of the ways Shumaker searches is by sharing. Shumaker writes about nature with both awe and simplicity. Shumaker is trying, constantly, for the hardest thing a poet can do: she is trying to be true. Today's book of poetry will argue that Shumaker is totally successful. sionaries, ones who could see what lay buried not far beneath. earth, this life, everything loaned for a brief time to us. Our morning read was splendid. Kathryn, our Jr. Editor, took a real shine to Peggy Shumaker, and why wouldn't she? Cairn is a massive collection with nary a let down moment. This morning's reading was a real pleasure for both the readers and the listeners. Cairn lent itself to reading aloud because Shumaker imbues a calm and certain assurance to the reader. These are journeys you are going to enjoy, be enriched by. You can be a friend and follow. 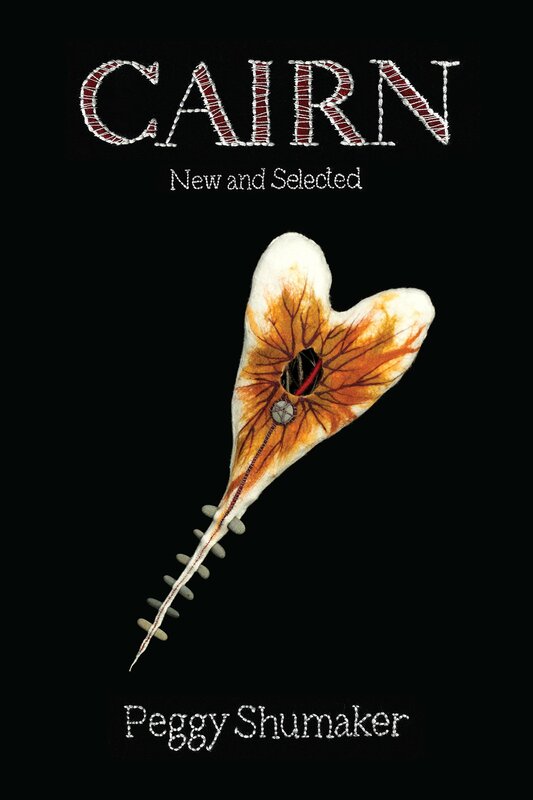 Cairn - New and Selected is exactly what Today's book of poetry wants from a book of poetry; beautifully true and intellectually fulfilling (if Today's book of poetry can say such a thing), and emotionally satisfying. Nothing simple about Peggy Shumaker's poetry, anyone who says so can't read. That's the whole can of soup. Peggy Shumaker is the daughter of two deserts—the Sonoran Desert where she grew up and the subarctic desert of interior Alaska where she lives now. Shumaker was honored by the Rasmuson Foundation as its Distinguished Artist. She serves as Alaska State Writer Laureate. She received a poetry fellowship from the National Endowment for the Arts. Shumaker is the author of eight books of poetry, including Cairn, her new and selected volume. Her lyrical manner is Just Breathe Normally. Professor emerita from University of Alaska Fairbanks, Shumaker teaches in the Rainier Writing Workshop MFA at Pacific Lutheran University. She serves on the advisory board for Storyknife and on the board of the Alaska Arts and Culture Foundation. Shumaker is editor of the Boreal Books series (an imprint of Red Hen Press), editor of the Alaska Literary Series at University of Alaska Press, poetry editor of Persimmon Tree, and contributing editor for Alaska Quarterly Review. Please visit her website at www.peggyshumaker.com.